You have heard of living large, here we have the opposite. Jay Shafer lives in 89 square feet and it worked out so well he now makes a living building tiny houses for regular sized people. When we were kids we had Nerf footballs, and basketballs. Today I discovered what today’s youth have. Nerf assault weapons. 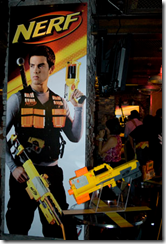 The Nerf Stampede is a fully automatic, battery-powered dart assault rifle. The new rifle will come with three new, 18-shot extended magazines, offering much more firepower than the standard 6-shot magazines. And I thought my Nerf football with the auto-spiraling grip was cool back in the day.